For gear heads, racers, and avid lovers of cars and motorcycles, Ruthless Performance Motorsports has the aftermarket parts to get your vehicle to the next level. 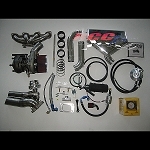 From custom turbo kits, to superchargers, you can find quality parts made in the USA and backed by limited warranties. If you seek a performance boost, you've come to the right place. Our aftermarket performance parts are designed to upgrade horsepower, improve handling, and improve speed. We use these parts in our own vehicles because their quality and supreme workmanship can't be matched. With our wide selection from many well-known manufacturers such as RCC, HAHN, and many others, you can build the vehicle of your dreams.